As I've been playing through The Division lately and sniping some Rioters from afar, I couldn't help but think, "I sure wish time would slow way down and I could see the gut-busting impact these bullets were having on those guys." I must not have been the only one thinking that as Rebellion has just announced that Sniper Elite 4 will be hitting PC and consoles sometime this year. Picking up where the last one left off, we'll continue the journey of Karl Fairburne as he now fights alongside the Italian Resistance as they work to take down Mussolini's regime. 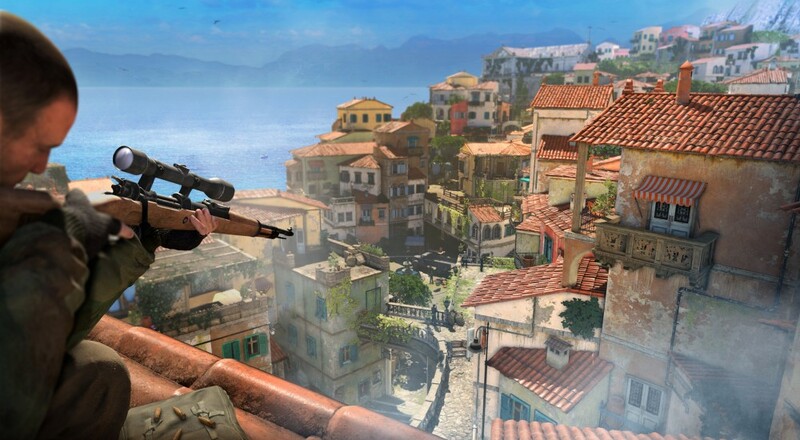 You'll be traveling through the majestic hills, villages, and vistas of the Italian countryside as you aim down your scope, line up the shot, and watch as some dude's skull gets very badly damaged. There's no specific release date given for the game just yet, though Rebellion has confirmed that the campaign will be entirely co-op for up to two players and there will be some additional co-op modes. The Sniper Elite series, and its Zombie Army counterparts, are some of my favorite first-person shooter titles over the past few years. Despite what one would think, their slow motion bullet cam stuff never gets old. I'm hoping this iteration will add a few new features, like maybe a co-op bullet cam.